In addition to the comments about the Torah and Purim below, I have a general Torah Commentary called Torah Thoughts Etc. It's both serious and slapdash, being a blog, and, given world enough and time, I would rewrite most of the commentaries but ... Click on the title to go there, and get the "first drafts" of these Torah insights. If any editor or publisher is interested in these pretty original essays, I'd be happy to rework them for publication. Now that we've established that you have to think about Purim on Chanuka, click on the pic for a Purim video! 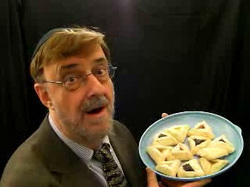 No hamentashen were injured during the making of this video.